"I chose to be a designer when I was 15-years-old," Yves Béhar told Wareable, as we perched on two Norwegian designed stools in the corner of the Hive stand at a London Design Week show. Béhar has been behind some of the biggest devices in wearable tech – and where top class design has prevailed, the chances are that Béhar and his San Francisco studio Fuseproject were behind it. "For me design is not so much defined by particular area, in fact I started Fuse because notion of fusing different ideas together was what I wanted to practice," he said. Quickly our chat had all the hallmarks of a sit down with any designer as we quickly moved onto the beliefs and rules that govern the look and feel of Béhar's products. "Pretty early I felt that design shouldn't be limited by specific practices, and it's been confirmed that in this highly connected world, a full ecosystem has to be delivered in terms of technology and design," he explained. "It's served us well, at the Fuse project. It serves us well to think about this kind of ecosystem." But now is the time to talk hard facts. Béhar's wearable and IoT design CV reads like an awards list for the year in tech. 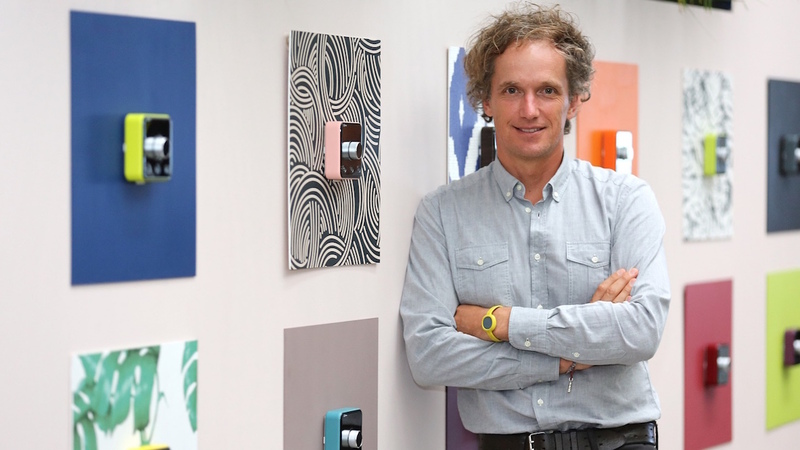 British Gas' new Nest killing thermostat and August smart locks have come out of his studio and he's been the creative lead at Jawbone for 14 years. But what are the secrets to his success? Béhar says that discretion is the key to making successful wearables. "There specific values that I apply to all products but especially relevant to connected products is the idea of discretion, and the invisible interface. I think we are subjected today to a kind of addiction to our phones. They are attention-sucking monsters in our lives and it creates a lot of social tensions, and it creates a lot of missing really of real life. "While I believe the information we get from connected devices and the control they offer us is something we don't want to live without I do believe in designing them in ways that are discreet and won't affect our lives and blend nicely in our home and our bodies." Of course, while Jawbone has recently delivered upgrades to its Jawbone UP2 and Jawbone UP3 trackers, these were to address shortcomings in the original design. Cast your mind back a year and the UP3 was beset by delays caused by the company's attempt to waterproof the design – a feature that never made it to the final version. And our original reviews complained of a poorly designed clasp that often came undone. All under Béhar's watch. However, somewhat surprisingly, Béhar admitted that the update to the UP2 band was always planned, and was bullish about the UP3's lukewarm reception, revealing that there were more big updates in the offing. "The Jawbone UP2 version one and version two were designed at the same time and, for reasons of manufacturing, we started with the original version. Version two was always planned for the fall with new finishes." And what about the initial reaction to the UP3? Béhar preferred to look forward at the improvements still to come, than back at the frustrations of last year. "We said that when we presented the UP3 that it's a platform that will significantly improve over time, and the new update is a big leap forward – and you can expect more big leaps coming shortly. "There is always an evolution to the UP3 and you saw the new software update and the new colours. So now we have the auto-detection of sleep that's a big one, and we have a lot of features coming in, like resting heart rate, which is now shown through the day. People find that compelling." With a bumper Christmas expected for smartwatches – with big name devices such as the Samsung Gear S2, new Moto 360 and the Apple Watch all going head-to-head – we at Wareable asserted that the category could be set to go mainstream. However, Béhar is far from convinced, and believes that while early adopters may love the smartwatches on offer today, the ordinary consumer is still yet to see the benefit. "It's hard for me to comment on smartwatches as they are completely unrelated to other things that we are doing. I think that the function of a watch to bring email, information and other things to the wrist is something that some people like, but it's something other people find another distraction," he said. Looking at Béhar's wrist there's unsurprisingly a Jawbone UP3 and UP2, but no smartwatch. Perhaps when he speaks of smartwatch doubters, he really means himself. "I have always been a believer that whether it's the Hive thermostat or the Jambox or the UP that our job is to remove complexity. I think there's still a way to go for smartwatches to be convincing to people who are looking to simplify their lives," he argued. But what about the smart home? Both August and Hive are both aimed at the home – a market that arguably is even more nascent than wearables, which have been around in some forms for years. However, Béhar believes the benefits of the smart home make its adoption more seamless than wearables. "It's in the early adopter phase but I can tell you that when it comes to removing friction: I have not had keys in a year. And looking for your keys by tapping your pocket or looking in your bag – that is a lot of friction, that is a lot of anxiety that is unneeded in my life," he said. "So when it comes to technology that changes your life by simplifying it, the smart lock that I've been working on and other smart access technologies have a tremendous future," he said. But how does a designer from Silicon Valley rate working with one of the world's biggest utility companies in British Gas? "I visited the Hive offices in London and I was blown away, because it didn't look like a big utilities company, it's a busy bustling chaotic and dynamic startup full of young 20 somethings. So it was very familiar to me. I partner with a lot of these types of companies in Silicon Valley and it as refreshing to see that in London," he said. "They had speed in mind, fast prototyping and doing things differently, and it was fascinating for me to meet Hive as a dynamic start up and visiting customers all over England in their homes, young and old customers. And realising this is not going to be a technology for early adopters, this has to be a technology for everyone, so it has to be designed from their point of view." There's no doubt that the wearable space is gaining momentum, and has transitioned from a bunch of plucky start ups to a major and fast-growing category. And even the start ups of old – like Fitbit and Jawbone – are now major players. However, what's the challenge for designing wearables in 2015, 2016 and beyond? For Béhar, it's still about simplifying. "I think we are in the infancy of all of this: the notion of health on your wrist, information on your wrist, the notion of technology on your body – it's extraordinary what we're going to see over the next five years. And Béhar believes it's the medical industry that's going to change the most. "We live in a culture now where people have a positive response to change – both consumers and investors. It's a time that's full of promise, full of exploration, full of prototyping – and it's the best time to be a designer and an innovator," he said. "I think the largest potential is for wearable technology to change heath and healthcare. Going from a system that checks you once a year to health monitoring that goes on 24/7. Monitoring that's preventative, more informed and personal as well – there's no doubt to me that will change radically for the better. And if there's any large system that needs transformation, it's the health care system." And unsurprisingly, when we asked him whether he'd be answering the phone to health startups looking to create new products, his answer was a resounding yes. "Oh, absolutely. There's so much possibility and opportunity. There are a couple of projects we're looking at but I would jump at the opportunity. "